The poster children of Egypt's Arab Spring turned out to vent their frustration and conspiracy theories on Hillary Clinton. One could not help but feel a modicum of sympathy for US Secretary of State Hillary Clinton. Her motorcade was pelted with shoes, tomatoes and an occasional water bottle. The demonstrators serenaded her with calls of Monika Monika, recalling one of the low points in her marriage to William Jefferson Clinton. Moreover, it represented the frustration of a damned if you do and damned if you don't American foreign policy in the Middle East. The forces behind the anti-Clinton demonstration were, ironically, the liberal parties and movements that had originally been the poster children of the Arab Spring. Now all the liberals and Christians were accusing Clinton and the Obama administration of forcing the Muslim Brotherhood down Egypt's throat in the hope of currying favor with the Islamists. Clinton tried to allay their fears at a ceremony in Alexandria where she called for religious tolerance and respect of minorities: "Real democracy means that no group or faction or leader can impose their will, their ideology, their religion, their desires on anyone else," she said. While one would like to feel sympathy for the Egyptian liberals and Christians who suffered persecution under the Mubarak regime and can expect even worse under the Islamists, this sympathy is undermined by the annoying tendency of Egyptian liberalism to try and outbid other forces in displaying its antipathy for Israel. Take the case of Emad Gad, imprisoned under Mubarak for his effrontery in mounting a candidacy for the Egyptian presidency. This leader of the Egyptian Social Democratic Party claimed that the Clinton visit to Egypt was part of a US-Muslim Brotherhood deal calculated to protect Israel. In an interview with Al-Ahram's Arabic website, Gad explained: "In exchange for Morsi's being named president, the Brotherhood is expected to protect Israel's security by pressuring Hamas – the Brotherhood's branch in Palestine – not to launch military attacks against Israel, and even accept a peace agreement with Tel Aviv." Similarly, according to Gad, the Muslim Brotherhood pledged not to renew ties with Iran because such a new renewal of relations would pose a threat to Israel. Gad is a respected political analyst and one would expect him to shy away from wild conspiracy theories. It is Syria, rather than Israel, that accounts for the current chill in relations between the Brotherhood and Iran. Iran has forfeited her support among non-Shiites as a result of the fighting in Syria. 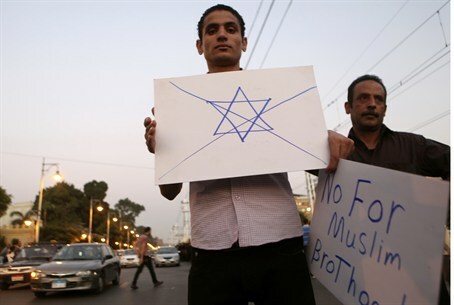 Unfortunately, what was said in Cairo is still standard practice among Arab Christians, who, when it comes to Israel, must be more anti-Israel than the Muslims - even to the extent of accusing the Muslim Brotherhood of being soft on Israel.